This summer experience the seductive scent of summer with a luscious fragrance that makes every woman feel divine. Inspired by a luxuriant tropical beach under the constant heat of the sun, Bronze Goddess is built around a creamy heart of golden Amber that emanates pure summer. The core of this Radiant Amber scent exudes smooth sensuality. The creaminess of Coconut Milk, Sandalwood and Vanilla unwinds with silky warmth. The exotic combination of Vetiver and Myrrh deepens the sexiness with its embrace. Velvety smooth Amber, with its warm, mysterious scent, glows at the center, pulsing the uninhibited spirit of summer's sultry heat through the fragrance. The vibrancy of bright, zesty elements infuses the fragrance with sun-drenched lightness. Juicy Mandarin, Sicilian Bergamot and Lemon blend with Pulpy Orange for a mouth-watering sensation. An intoxicating blend of milky flowers adds to the creaminess of the Amber signature. 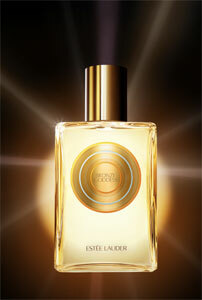 Luscious Tiare Flower and exotic Jasmine blend with the tenderness of Magnolia Petals for an indulgent floral effect. Orange Flower Buds add a glimpse of sunshine with lustrous floralcy, while fresh Lavendar adds a breath of softness. The Bronze Goddess fragrance collection features an indulgent Eau Fraiche Skinscent, complemented by a silky Body Oil Spray and a luxurious Luminous Body Lotion, which can be worn alone or layered together for an intoxicating sensory experience. Even the packaging reflects the radiant warmth of a summer sun and the refreshing tingle of cool ocean waves with a captivating golden medallion accented by energetic orange and soothing blue.